The Castle of Rochechouart was originally built in the 13th century, probably on the site of an earlier fortification constructed by the Viscounts of Limoges around the year 1000. The building was much altered in the next centuries to create a more comfortable living environment. 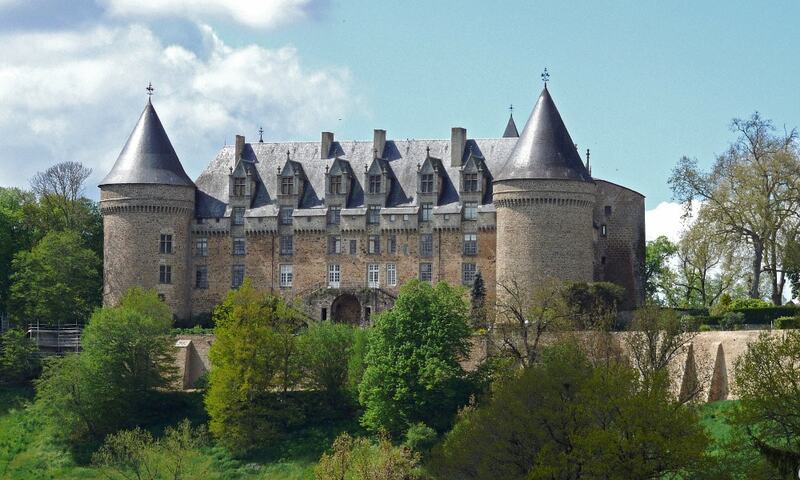 Until the end of the 15th century, the castle was the stronghold of a younger branch of the Viscounts of Limoges. Major renovations took place in the 15th century, and much of the castle's structure that still remained probably dates from that period. During the French Revolution, there was an attempt to demolish the castle, but the revolutionaries were only able to destroy the top two towers. The castle was bought by the department in 1836, and renovations were carried out between 1858 and 1859. One year later, the subprefecture and the town hall were installed in the castle. Today, the castle still houses the subprefecture buildings; since 1985 the Chateau is also home to the interesting Museum of Contemporary Art, where one can admire the works of Dadaist artist, Raoul Hausmann, as well as works of international artists from the 1960s to today. The museum has a large collection of modern art and there are frequent temporary exhibitions. There is also a hunting room, with multicolored frescos from the beginning of the sixteenth century, and a collection of prehistoric exhibits.